Nice fine bass boats will not guarantee you to catch more or bigger bass but they sure do look good don’t they! This is the time of year the dealers are offering big discounts on boats to get rid of their 2011 inventory. If you are looking for an advantage, then don't let the best deals pass you by. They come in all colors, sizes and price ranges. Porta-boat even makes a boat you can fold up and take with you! The options and selections are almost endless. But I think there are two categories you should keep in mind – NEW and USED. One other option you have is deciding between Fiberglass or Aluminum. Aluminum will cost less than fiberglass! You can go to the nearest show room that sells the brand you like and then stand there with your mouth wide open, looking at those beautiful shiny boats while you drool down your shirt. I always do that when I go to Bass Pro shops. 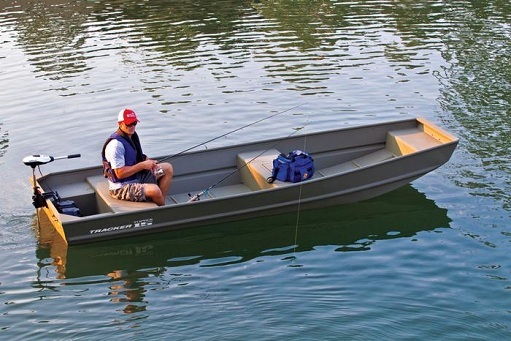 The TRACKER Topper™ 1542 LW is the only riveted flat bottom Jon boat to come with a built-in livewell. Depending on where you live you can always find boats for sale sitting in someone's front yard. Take advantage of this opportunity to get a good deal on one. But do not get fooled and disappointed. 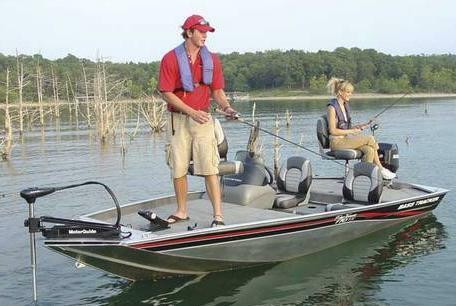 To get a detailed inspection list click used bass boats. Another way to get a killer discount on a boat is to attend a Boat Auction. I never thought about this before because I had never seen one or heard about a boat auction. The best way to find information about the boats and where to go to attend an auction is to click boats for auction. 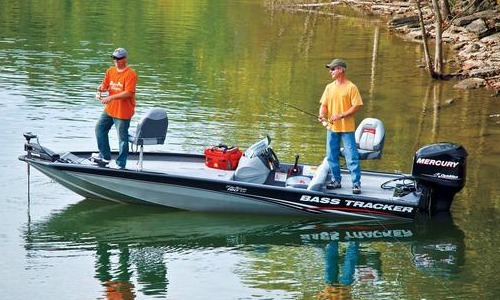 Tracker is the first and most famous manufacturer of bass boat complete packages. The one above is a 18'7" Tracker Pro Team 190 TX with a 90-horsepower Mercury Optimax. Click on the picture to learn more about this nice boat. The boat above is a 20 foot Triton 20SE. Click on the picture to read more. 2012 Alumacraft Fisherman-160. Click picture for more information. Got a bass boat you want to brag about? Do you have a bass boat you are proud of? Bass boats are pretty much all the same. Is your boat unique or dazzling? Do you want to sell it? Did you build it yourself? Submit a picture and a story and tell us about it. Why not? It's FREE! Enter the title of your story, such as the name of your boat. Taking care of a boat takes a little work and we all need a few tips on what to do to make our investments last. For steps on taking care of your boat during the winter months click here for WINTERIZING. Here is a couple of links to tell you more about a few other brands as well.